Super casual, come as you are, BYOB — we’ll provide the burgers, grill and patio. It’s the recipe for a perfect late Saturday afternoon pastime, except when I invite my vegetarian friends. 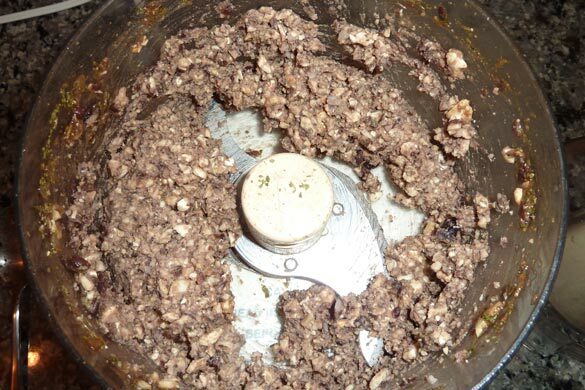 Nothing against those meat-haters, but some things just don’t mix: oil and water, spaghetti and tequila shots (I probably don’t have to explain that one), and meatless burgers and the grill. 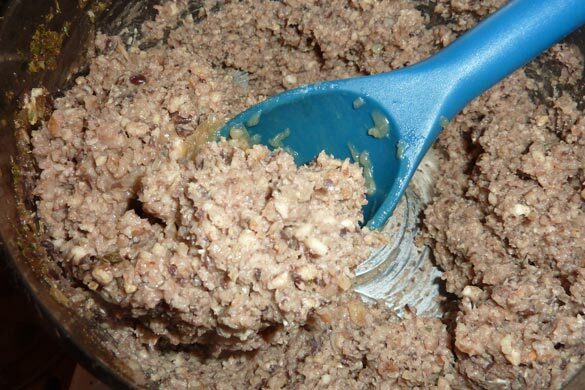 Sure those store bought, pre-pressed patties hold up pretty well but a scratch burger? Not so much. So when everyone is hangin’ on the patio, I dash into the kitchen and pan-fry a few for the vegetarians in the group — kinda breaks up the rhythm of the party, if you know what I mean. 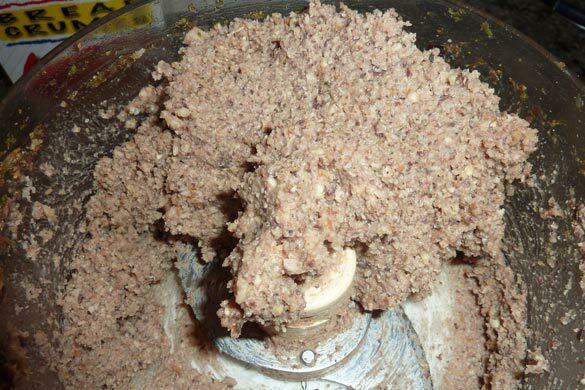 Determined to keep the flow going, I’ve researched meatless burgers high and low to find one that does not wimp out just when the party gets going. 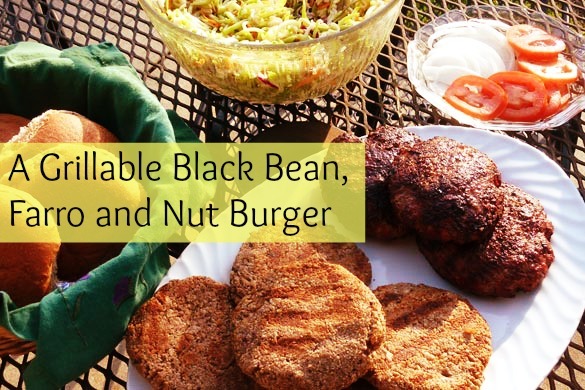 This truly grillable Black Bean, Farro and Nut Burger (BFN) from Veggie Monsters is tough enough to hang with the best of the ‘em, so fire up the grill. Chop ½ sweet onion and sauté with 2 teaspoons olive oil over med-high heat until golden, about ten minutes. Add ½ cup farro* and 1 cup vegetable broth, bring to a boil, reduce heat, cover and simmer for 10 minutes, remove from heat and let stand for five minutes to absorb any leftover liquid. 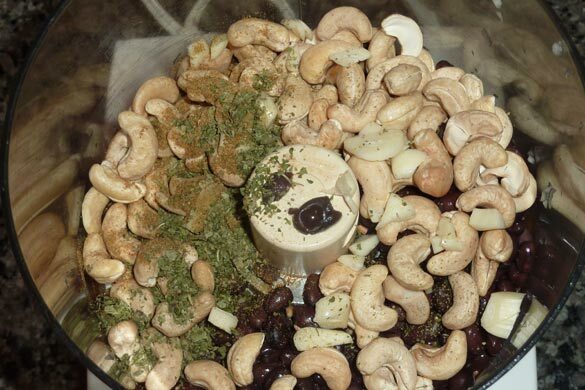 Toss ¾ cup rinsed and drained black beans, 1 ½ tablespoon soy sauce, 1 cup raw cashews, 2 cloves garlic, 1 teaspoon ground cumin and 1 ½ teaspoon cilantro into a food processor and pulse until coarsely chopped. 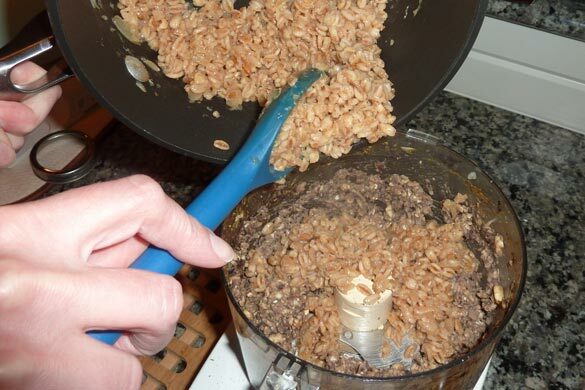 Add the cooked farro/onion mixture and pulse until combined. Form the mixture into five 4 oz. patties. Chill for 1 to 4 hours before grilling. Cook on a well-oiled grill, 4 minutes per side. The only farro I can lay my hands on is “quick cook” farro. If you have long cooking farro, you may have to increase your vegetable broth and cooking time. 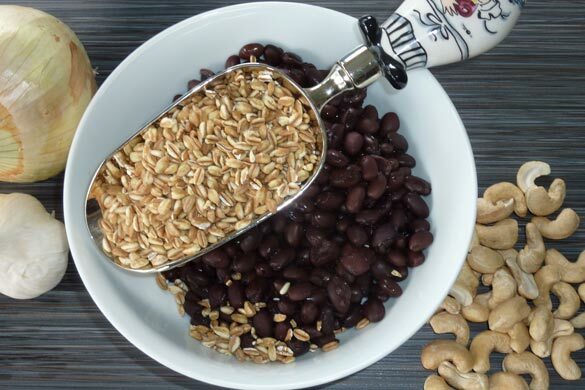 Basically, follow the instructions for the specific brand of farro that you’re using. 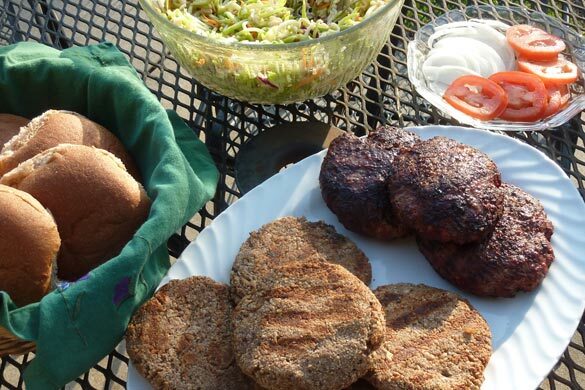 Also, if you are grilling beef burgers for a mixed crowd, be sure to start the cow patties (ooh, that does not sound so good) first to give them a head start, and throw the BFN burgers on after a few minutes so that they all get done around the same time. 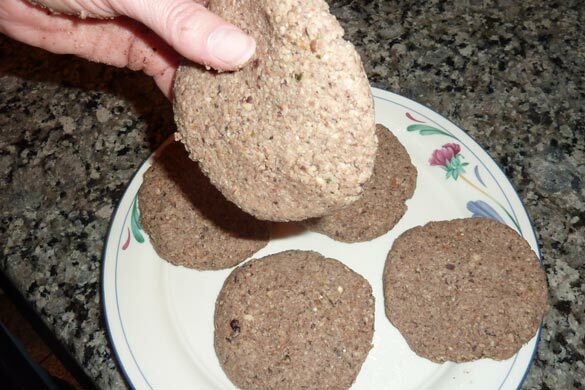 The raw BFN burgers freeze well if you only need one or two.